In order to quickly reach beneficial result, today’s marketing activities turn to focus on targeted groups in specific locations. People start to look for a new medium tool for those venues where they are never mentioned to play advertising or promotions in rich multimedia. Elevator is one of exciting places where people shuttle through every day. 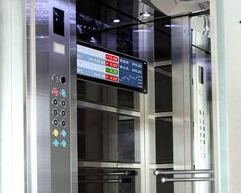 To meet the market’s requirement, Advantech provides an alternative – DSD-5038 stretched signage display, its super wide letterbox shape perfectly fits restricted elevator space.